At tonight’s event held at 21c Louisville, Kurt Gohde and Kremena Todorova took home a $5,000 grant to install a mosaic-like pattern on historic Lyon Square in downtown Grand Rapids, Michigan -- intended to inspire a visual petition during the ninth annual ArtPrize event this fall. LOUISVILLE (Kentucky) MAY 15, 2017 -- ArtPrize, the independently organized art competition recognized as the world’s largest annual public art event -- in collaboration with 21c Museum Hotel, Delta Air Lines and Experience Grand Rapids -- tonight awarded a $5,000 grant to Kurt Gohde and Kremena Todorova for their Pitch Night Louisville-winning entry, ‘Unlearn Fear & Hate’. Gohde and Todorova captured the attention of tonight’s five judges, including Karen Gillenwater, Museum Manager at 21c Museum Hotel Louisville. In addition to the grant, the installation earned a guaranteed spot at an historic outdoor venue in the heart of downtown Grand Rapids during ArtPrize Nine, slated to take place September 21-October 8, 2017. Tonight’s event was hosted by 21c Museum Hotel at their flagship Louisville, Kentucky location -- the first hotel of its kind, featuring a 9,000 square-foot contemporary art museum and an award-winning 91-room boutique hotel, in a city that could be dubbed the northern-most Southern city or the most Southern Midwestern town. Gohde and Todorova’s work was selected from among five artists that were invited to present at tonight’s Pitch Night event. Each artist was given five minutes and five slides to sell their ambitious, site-specific installation idea to a panel of local arts professionals including: Barbara Kutis, Assistant Professor of Fine Arts and Art History at Indiana University Southeast; Miranda Lash, Curator of Contemporary Art at Speed Art Museum; Sarah Lindgren, Public Art Administrator at Louisville Forward; Scott Massey, Director of Allen R. Hite Art Institute, Chairperson of Department of Fine Arts and Associate Professor of Sculpture at University of Louisville; and Karen Gillenwater, Museum Manager at 21c Museum Hotel Louisville. 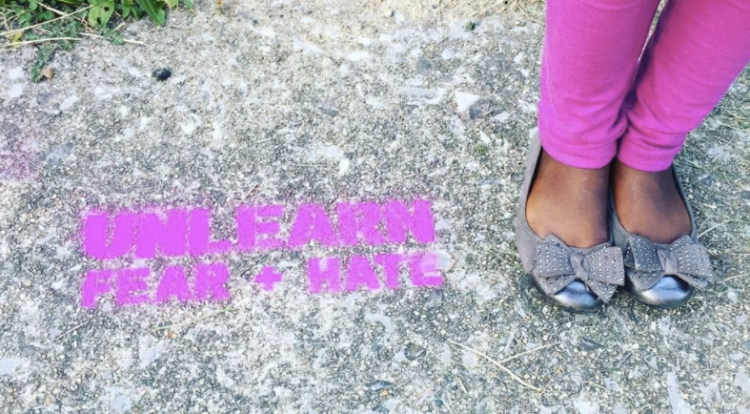 The interactive public artwork, 'Unlearn Fear & Hate' launched in August 2016 at 21c Musuem Hotel in Lexington, Kentucky. Artists Gohde and Todorova drew inspiration from the need for artworks that address growing national tensions and is based in the belief that fear and hate are learned behaviors that can be unlearned. Each iteration of the work has asked visitors to take pictures and share on social media -- creating a visual petition advocating for the need to unlearn fear and prejudice. “Having my picture taken in front of the halo means I believe it’s important to consider the ways in which I might be prejudiced against others and work to become less so, or the ways in which I might cause fear in others and change how I move through the world. And I also need to think about ways my community lives with fear and hatred,” said Todorova of this collaborative project. For Lyon Square, Gohde and Todorova will stencil a mosaic-like pattern of thirty halos on the ground, as well as transform the railing along the river’s edge into a large half-halo. Each will include the words “Unlearn Fear & Hate” in one of thirty different languages -- representing the most popular languages spoken in Grand Rapids. ArtPrize Pitch Night launched in 2013 as a means of discovering and supporting ambitious, exciting projects and to reduce the barriers to bringing them to the annual competition. Since its inception, the Pitch Night program has continued to expand and in 2016 includes events in six cities across the country. 21c Museum Hotels will host three events -- tonight’s in Louisville, KY; in Durham, NC on May 17; and in Bentonville, AR on May 22. The Museum of Contemporary Art Detroit will host a Pitch Night event on June 1, the Contemporary Arts Center, New Orleans on June 5, and the Indianapolis Museum of Art on June 8. Each event will award the winning artist $5,000 and a spot in a prominent ArtPrize venue during the eighth annual event.